Obituary – Johnson, Louise Jean (Grim) « Perry High School Alumni Association, Inc.
﻿Library Staff 53-54, Pep Club 53-55, Cheerleader 54-55, Office Staff 54-56, Junior Play 54-55. 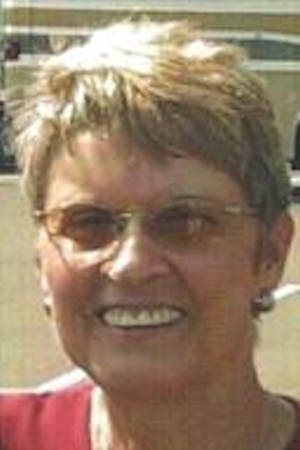 Louise Johnson, 75, of Perry passed from this life on Monday, February 17, 2014. Services have been entrusted to the care of Palmer Marler Funeral Home of Perry and a service celebrating her life will be held at 1 p.m. Wednesday, February 19, 2014 at Christ Lutheran Church in Perry, with Rev. William Metz officiating. Interment will be in Grace Hill Cemetery. Public visitation will be from 11am to 8 pm on Tuesday February 18, 2014 and the family will greet friends at the funeral home from 6-7:30 p.m.
Louise Jean Grim was born on January 21, 1939 on the Bellmon Farm in Billings, OK to Loyd and Joyce (Willhelmns) Grim. 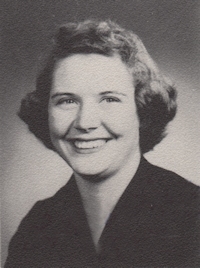 In 1948, her family relocated to Perry, OK where Louise graduated from high school in 1956. On March 5, 1955 Louise married her high school sweetheart, Tommy Johnson. Louise and Tommy had two beautiful children, Richard and Glenda. She spent several years as a stay at home mom, raising her children and caring for Tommy. In 1964, the family purchased the Dan-D Motel in Perry and operated it until retiring in 1989. Following her retirement Louise and Tommy purchased an RV and traveled extensively throughout the United States. She enjoyed cooking and was well known for delivering vast amounts of cinnamon rolls to the employees at Ditch Witch. The Johnson family has been longtime members of the Christ Lutheran Church in Perry, where Louise was active for years in the Lutheran Ladies group. Louise was a very gentle woman who was the very definition of selfless. She always had an encouraging word for her friends and family and her smile could brighten the darkest days. Louise always prioritized her family above all else and she spent nearly 25 years caring for her mother and father. She had a way of making everyone around her feel like they were the most important person in the room. Louise Johnson was a dedicated wife, a caring mother, a loving grandmother, and a loyal friend. She will be dearly missed by all who knew her. Louise was preceded in death by her parents Loyd and Joyce Grim and sister LuElla Davidson.